Kitchen and home storage giant, Tupperware Australia/ New Zealand is seeking nominations for its Charity of Choice program in 2013 using social media to simplify the voting process. 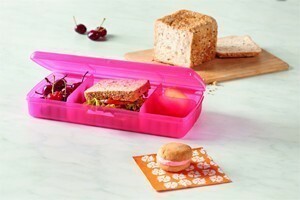 $2 from every sale of the Tupperware Sandwich Keeper Plus will be donated to a selected charity. Supplied. Charities can nominate themselves on the Tupperware Facebook page to be a contender for the bi-annual donation. In 2011, Tupperware Australia and New Zealand determined that its fundraising dollars would be directed to the charities deemed most worthy, as voted by Tupperware Australia/New Zealand’s 20,000 Facebook fans, and the Charity Choice program was launched. Every six months, Tupperware will invite fans to nominate their preferred local charity. The charities are then shortlisted based on the number of ‘likes’ on Tupperware Australia and New Zealand’s Facebook page. All fundraising dollars for the following six months are then donated to the top-voted ‘charity of choice’. Supporters can raise funds for the selected charity by hosting or attending a Tupperware party and purchasing the popular Charity Choice product. $2.00 from the sale of every Tupperware Sandwich Keeper Plus in Pink Punch sold during the selected six-month period will be donated to the cause. “Tupperware Australia is dedicated to enlightening, educating and empowering our sales force, customers and their families and we are very pleased to be able to extend our support to such a worthy cause”, says Charles Henry, Tupperware Australia and New Zealand Managing Director. In 2012, the sales of nominated Tupperware product saw Tupperware Australia donating over $37,000 YTD and New Zealand donating over $7500 YTD to various charities across the two countries. “We really want to align with the chosen charity, and extending the program from 3 months to the 6 month period is a good opportunity to really promote the chosen charity, ” Tupperware marketing manager, Tracy Pratt said. To nominate your registered charity, head to www.facebook.com/tupperwareausnz. Nominations are invited for one week from Friday 14 December until 5pm, Thursday 20 December, 2012 (AEST). Charity Choice voting will commence on Friday 21 December and remain open until midday (AEST) 31 December. The winning charity for Australia and New Zealand will be announced by 5pm (AEST) on 31 December, 2012.